One of my favorites ways to relax has always been hanging out in the backyard with my partner, friends, and/or dog. Being close to nature is important to me and does wonders at bringing peace in my life. That’s why whenever I see a beautiful backyard getaway, I get totally envious. If you too are always on the hunt for new ways to spruce up your backyard oasis, you’re going to love this list of DIY backyard ideas! If you’ve got an old trampoline hanging around, don’t throw it away! It can be re-purposed into the most amazing hanging bed for your backyard. For large backyard, you gotta have some large furniture to match it. A pergola with hanging benches and string lights will create a relaxing ambiance for you and guests. Take it to the next level by adding a fire pit for colder months. Tires can seem pretty pointless once taken off cars but can actually be made into pretty cool things! You can make a pond or even a dog bed out of it (weird, right??). Flowers are a great way to add some needed color to any yard and brighten the mood. Want a tree house but don’t have any trees large enough to accommodate one? Not a problem! Try this guide by The Handmade Home for the perfect treeless house. Cable rails are very stylish but can cost a ton to have it professionally done. The great thing is that they are actually pretty easy to make if you have a guide. If the hanging benches might make you dizzy, you can still enjoy a fire pit and ambient lighting. Define the space by creating a path and patio area. This log pathway DIY will create a mysterious look to your garden that everyone will love! 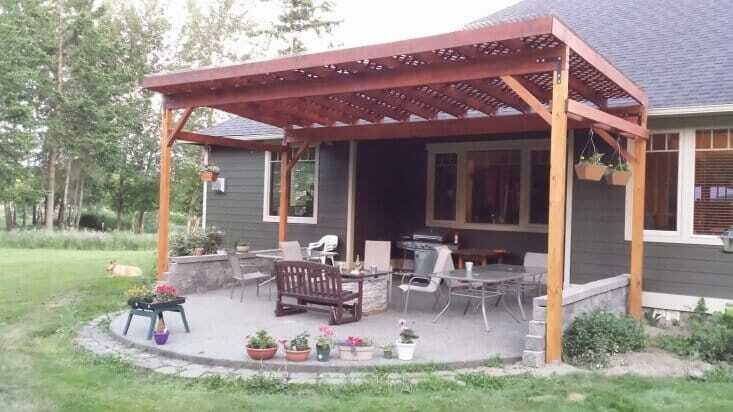 If your backyard lacks proper shade, create a simple covering to create a comfortable year round space. While this looks totally expensive and techie, guess what? It’s only paint! Grab yourself some glow in the dark paint and just go crazy with it! Having a dog means danger for a lot of things in my backyard, but especially my garden hose. Create a stylish space for your hose and you will save sooo much money! If the weather permits, why not spend a little extra time in the yard this year? It’s really gratifying to take on some DIY projects and it saves a ton of money too! Plus, it’s a great way to get the rest of your family involved and bond. Win, win!